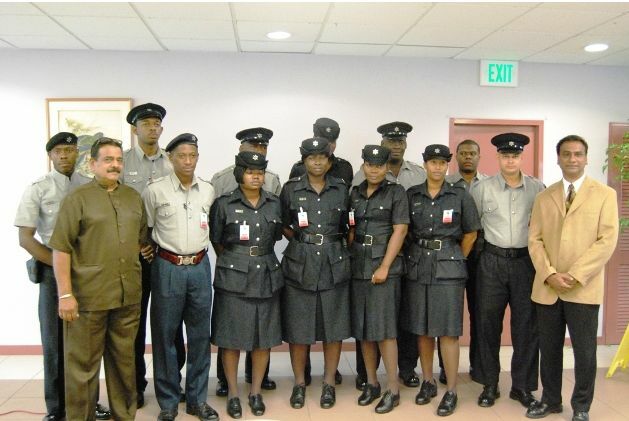 The fight against environmental violations continues as the Environmental Management Authority (EMA) welcomed twelve (12) new Special Reserve Police Officers to perform full-time duties. At an orientation and training workshop on Monday May 18th, 2009, EMA’s Managing Director/CEO, Dr. Joth Singh welcomed and handed out Instruments of Appointment to the new recruits who have been assigned by the Commissioner of Police to help the EMA with enforcing its environmental legislation. The last batch of Environment Police Unit (EPU) officers was reabsorbed into the police force, and for a few months the EMA was left without environmental police officers. This prevented the EMA from accomplishing some of the work that it is mandated to do under the Environmental Management Act, 2000. In this light, Dr. Singh indicated that the organization, especially the EMA’s Compliance Officers (who monitor projects with Certificates of Environmental Clearance or CEC) and the Legal Department, were very happy to continue the organization’s mandate with this new and much needed support. “The previous batch,” Dr. Singh said, “were dedicated and environmentally conscious officers who were committed to the work of the EMA, and assisted us for roughly ten years in their official capacity.” It was in this regard that he welcomed the new officers as a part of the EMA family. The EPU have been in existence for the past 10 years and the officers deal with offences under the Litter Act and the Motor Vehicles and Road Traffic Act. This includes patrolling the highways and trying to educate drivers on reducing their black smoke emissions. Their job also takes them to illegal dump sites and they patrol areas where illegal quarrying is suspected. On the advice of the EMA’s Compliance Officers and the EMA’s Helpdesk (where official complaints come to the EMA), they investigate holders of CECs to monitor compliance to the conditions of the CEC. The Environmental Police Officers are required to be knowledgeable in environmental protection, monitoring and enforcement and will therefore undergo special training to perform their unique functions. The workshop also provided an orientation to the EMA’s subsidiary legislation such as the Noise Pollution Control Rules, 2001; the Certificate of Environmental Clearance Rules, 2001; the Water Pollution Rules (Amendment), 2006; the Environmentally Sensitive Species Rules, 2001 and the Environmentally Sensitive Areas Rules, 2001.